This Saturday’s college slate gives us a quick breather from the top-ranked, head-to-head matchups we’ve seen so much of lately. The weekend features only one contest between ranked teams and a number of distinct favorites squaring off against theoretically lesser opponents. That doesn’t mean we won’t see our fair share of surprises. It does mean that if you like betting money lines, you stand to make a nice chunk of change if your underdogs hit. In the NFL, the three remaining unbeatens all hit the road, two of whom will be playing in very hostile environments. Once again, here’s what you should be watching…. If you like speed, this could be the game to watch. 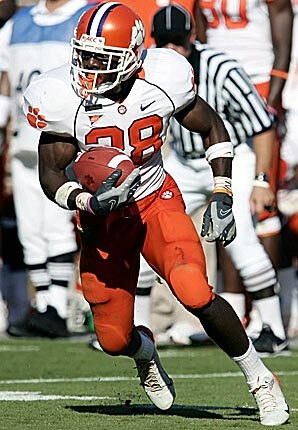 At 3-3, Clemson still has a chance to win the ACC’s Atlantic Division but any effort the school put into hyping CJ Spiller as a Heisman candidate could have been better invested in junk bonds. Spiller has only scored three touchdowns this season. 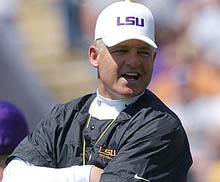 The Tigers face a Miami team which is ranked 10th in the BCS but 4th in their own division. Go figure. Clemson has yet to win a road game and Miami has yet to lose at home this season which means the Hurricanes should definitely win this game, right? 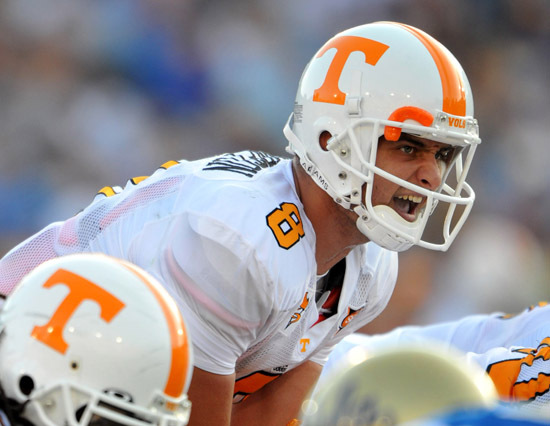 Tennessee is the next team to step in front of the Alabama firing squad. The Volunteers are coming off a bye week and an impressive 45-19 victory over Georgia the week before. Jonathan Crompton, hot of late, will face a Crimson Tide team that leads the nation in defensive pass efficiency. Tennessee coach Lane Kiffin recently signed a six-year deal that will pay him just under $2.5 million a year, which is still considerably less than Nick Saban makes. We’ll see if Kiffin can earn that payday this Saturday. Penn State hasn’t won in Ann Arbor in 13 years. Advantage Michigan. The Nittany Lions have won their last three games by 87 points. Advantage Penn State. Michigan hasn’t lost at home and boasts the nation’s 8th best rush defense. Advantage Wolverines. Penn State is favored and the higher ranked team. Advantage Nittany Lions. The Saturday afternoon forecast is 44 degrees and rainy. Advantage me. I live in Florida. Iowa remains the Big Ten’s only undefeated team, currently ranked sixth in the BCS. The Hawkeyes are the conference’s best hopes of a BCS title shot, however, they have dropped four straight in East Lansing, having last won there in 1995. Even though the Spartans are 4-3 overall, a win over Iowa will put them atop the Big Ten, a conference apparently nobody other than Iowa wants to win. The Hawkeyes have rattled off eleven straight victories dating back to last year and will once again have to prove to pollsters they’re for real. The Mississippi State Bulldogs haven’t beaten a ranked opponent in four tries but the Gators haven’t won in Starkville since 1985. Florida has struggled offensively lately yet they remain atop the BCS standings. Even though they have a two game cushion in the SEC East, Florida cannot afford to make reservations for Atlanta just yet. On Saturday, they will face a coach who’s quite familiar with their team. 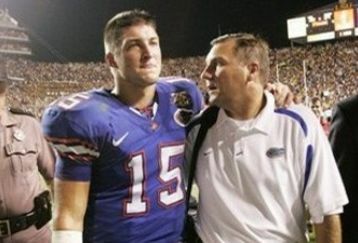 Dan Mullen, who accepted the Bulldogs’ head coaching job in the off-season, was the offensive coordinator for Florida’s two recent national championships. He also coached with Urban Meyer at Bowling Green, Utah and Notre Dame. This Mountain West Conference matchup is Saturday’s only game between ranked opponents. This game features the 6th and 16th highest scoring offenses in the nation yet for some reason, the over/under in this game is only 51. BYU and TCU average a combined 73 points per game! We’ll see if enough people read sportschump.net and bet the over so that the line moves. I’m not holding my breath but I know where my money’s going. Conference rivals have lost their last 13 games in Provo. Texas Christian ended BYU’s 16-game winning streak last season so the Cougars could be looking for a little revenge. 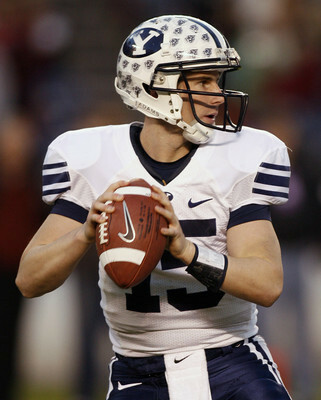 BYU QB Max Hall is fourth in the nation in passing efficiency. Usually this game is for SEC West Supremacy. Now they’re just fighting for second place. LSU had a bye week to stew over their home loss to Florida but are not out of SEC West contention just yet as they still have to play Alabama. Of course, they’ll need some help if they want another shot at Florida in the SEC Championship game. After starting 5-0, Auburn has lost their last two to Arkansas and Kentucky. A night road game in Death Valley is no way to break a losing streak. The Vikings are undefeated on the road this year, but they haven’t been to Pittsburgh yet. The Steelers haven’t allowed a 100-yard rusher in 24 games but they haven’t faced Adrian Peterson yet. Peterson only has two 100-yard rushing games this season, but still averages over five yards a carry. He’s been limited in practice this week with a bum ankle but should be ready for Sunday. After a rough start, Pittsburgh has won three straight. Expect a rowdy crowd in Heinz Field, eager to give the Vikes their first loss of the season. In a battle of Big Ten quarterbacks, it’s safe to say Drew Brees (Purdue) has had a slight professional edge over Dolphins QB Chad Henne (Michigan). 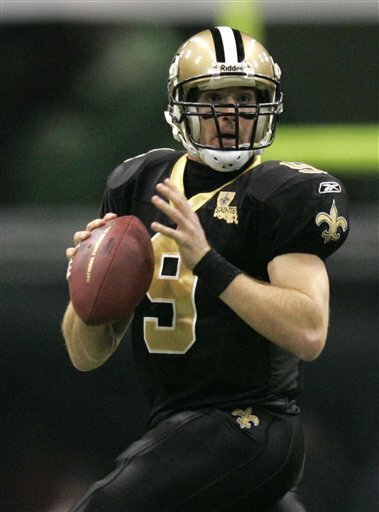 In fact, Brees almost became a Dolphin in 2005 but ended up signing with the Saints. New Orleans hasn’t looked back since. In 2008, Brees threw for over 5000 yards and is on a similar pace this season. Meanwhile, the Dolphins have started seven different quarterbacks since Brees hit New Orleans. There’s no way he could still hold a grudge against Miami, is there? What are the odds Cowboys owner Jerry Jones leaves this game thinking what everyone else already knows, that Matt Ryan is already a better quarterback than Tony Romo. The Cowboys are coming off a bye week in which they saw each of their division rivals lose but they’re still a far cry from a playoff lock. With the Giants sitting atop the NFC East and the Saints atop the South, this game is vital as both Dallas and Atlanta may be competing for the same wild card spot. 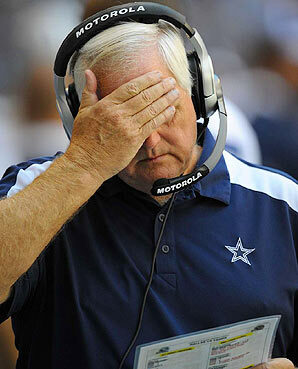 As is usual with the Dallas Cowboys, the drama continues. A win will silence the critics for another week. A loss means the Wade-watch is on once again. This entry was posted in Pigskin, Screen and tagged Adrian Peterson, Alabama Crimson Tide, Atlanta Falcons, Auburn, Big Ten, BYU, CJ Spiller, Clemson, College Football, Dallas Cowboys, Dan Mullen, Drew Brees, Florida Gators, Iowa Hawkeyes, Jonathan Crompton, Lane Kiffin, LSU, Matt Ryan, Max Hall, Miami Dolphins, Miami Hurricanes, Michigan State Spartans, Michigan Wolverines, Minnesota Vikings, Mississippi State Bulldogs, NCAA, New Orleans Saints, NFL, Nick Saban, Penn State Nittany Lions, Pittsburgh Steelers, SEC, TCU, Tennessee Volunteers, Tony Romo, Urban Meyer, Wade Phillips, What to Watch by Chris Humpherys. Bookmark the permalink. That Vikings Steelers’ game should prove to be a good one. As too will the college game between Miami,Fl and Clemson. Any truth that Zorn will also be conducting the Skins’ cheerleaders as they strut their stuff ? As it’s being rumored that’s about the only job that Snyder and Cerrato really want him to do. My thoughts on the ALCS so far. What’s the old saying about working in an office and having your desk moved closer to the door? Well, Zorn’s just done so. I agree, Vikes-Steelers should be a fun one to watch. I was saying I can get that for free so why pay the thirty, silly. Jim Zorn is a nice guy , really he is . It’s just that he’s just not the sort of guy you’d want backing you up in a knife fight or a shootout. He’s too friggin’ soft for his own good ! Dropped this on the Hawkeyes’ Kirk Ferentz. As I believe that should the ‘skins go the college route for their next coach. He may well be the guy that they ought to go after. Kirk Ferentz Come On Down The Price Is Right ………. $30 ? I wants me one of those females ! That way I don’t have to put up with the ‘month end cycle’ when the girlfriend chooses to stay over at my crib. I hear the Glazers want to gut the team and open the roster to the lowest bidders ? LOL,LOL,LOL !!!! What’ll they get for Antonio Bryant, Michael Clayton, Torrie Cox, Chris Hovan , Sabbie Piscatelli, Stylze White and the inglorious Carnell Williams. Looking at him and seeing Ronnie Brown. And you can see the horrendous mistake that Gruden and Allen made in taking Williams. And there were idiots saying that Williams was the better choice ! WTF had they been drinking ?